After studying previous years’ influencing trends and factors on online shopping during the holidays, we had our eCommerce impulses throbbing to help online stores reap larger-than-life retail profits this 2012 Holiday season. 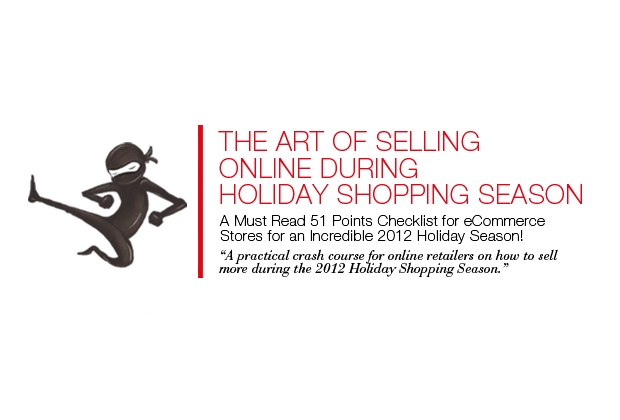 The eBook is a 51- pointer checklist that will prepare eCommerce stores in time for the holiday goodness. Lot of stores wait a good amount of time before going all holiday on their stores and look for spikes in their holiday selling graphs post the mayhem. The spikes would be there but would they be high enough? Find your answers in this sales guide and get started now! Remember if selling is an art then selling during the holidays is the ultimate test of the art. Yes that’s right! Holiday selling requires a whole new set of rules, dimensions and of course, efforts and implementations. Whether you are in the meatspace or online, you need to pucker up for the holiday season and be prepared in mind, body and soul to face the flow of uninhibited shoppers. The Art of eCommerce Holiday Selling ebook is about 3.11 MB in size and is in easy-to-read PDF format.